The weekend went by in a whirlwind. Here we are on Wednesday and the kids are almost settled back into their routine of going back to “classical” school work. As I sit here and reflect about the past week, I find myself missing the Authentic approach that we have just come from. Our entire middle school was engulfed in a process that had EVERY student experiencing an authentic learning experience. 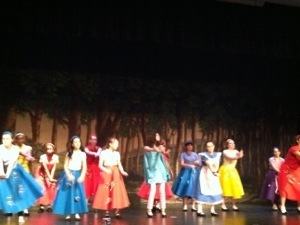 It was such a wonderful experience for me to see how each student have grown into the roles that they chose to do. Many of them have never had the chance to build anything and now they have become set builders. Others have never created, built, and organized props and they became property masters. 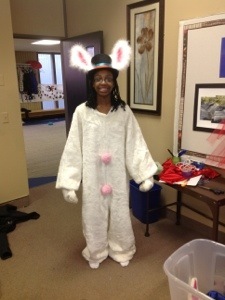 Students who helped with costumes became costumers. Kids in the booth- became are theatre technicians. Students assigned to the front of the house now have marketing experience. Assistants have became assistant directors and kids on stage you have became actors during this process. It blows my mind that these kids BECAME what they chose to do. It really doesn’t matter that it was only for a short time. They had an amazing out of “classroom” experience. That is what counts…. Day 5: Time to Leap! It is the opening of the show. There is a huge buzz of excitment around Allendale Columbia Middle School. The amount of energy that the kids have today could power all of Rochester. Set and props crew are feeling more and more confident as they practice their set changes. Quick changes are going a little more smoothly this morning and the Tech crew is working to make sure that music cues are being played on time and that mics are turned on. The actors are learning their track (knowing when they go on and off) with confidence. The Marketing crew are getting programs ready for this evenings performance. Our dress rehearsal went off without too many glitches. The set changes got a little hung up especially with the Mad Hatter Table in the second act…but it is all about practice. They will get it! There are many visual elements that have come to life. 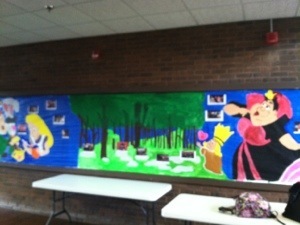 The kids now know how each and every one of them is responsible for bringing this story to life! It is time to take the leap tonight! The kids are coming along for the ride- and boy is it THRILLING!! Day 4: Go down the rabbit hole? DAY 4: Yesterday the time at Allendale Columbia just flew by! We did a complete dress rehearsal with makeup and costumes. It was important that we did this so we could figure out timing. On our final dress rehearsal, I would like things to be more relaxed rather that frantic as it has been in the past. Our makeup crew, who is also our costume crew, got everything together, our tech crew got the mics on the kids and we began our sound checks. While that was going on, I met with the prop and set crews just to make sure they had their run sheets completed. With the help of a stage manager and theatre colleague at the Merry-Go-Round Playhouse/Finger Lakes Musical Theatre Festival. She taught me how to and what formal paperwork that is needed. I took that knowledge to the crews and explained to the crews that they needed to complete a similar or create their own run sheet. A very basic one was given for them to fill out. Costumes and actors had to figure out the art of the “Quick Change” and it all started to come together. The afternoon was filled with completing the complete run and then running it again with set changes. But we did it! The kids were VERY excited by the end of the show. As their teacher and director, I realized today WHY blogging is so important. It isn’t about bragging about what you did in your classroom. It is about REFLECTING about what you did and inviting others to reflect on what they read or about their own experiences. I see a whole lot of teaching still going on during the process this week. It may not be about learning about what is in a text book about a specific subject… but it is in there. These are truly getting an authentic learning experience and so am I!